A great portable radio is your passport to the world while traveling, even in remote areas. 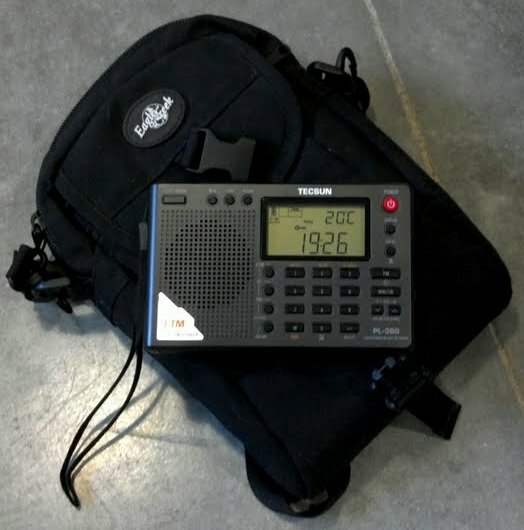 I receive a lot of emails from SWLing.com readers, quite often from those who about to embark upon international travel–sometimes to remote locations–and who are looking for a durable travel shortave radio. These travelers are looking for a basic travel radio which, while it might not need to survive being submerged underwater or dropped from a cliff, will hold up in the semi-protected environment of a suitcase or backpack experiencing some rough baggage handling. To be clear, none of the radios on the list that follows are marketed as “ultra-tough radios”–indeed, I know of no capable SW portable that is–but these do represent the most durable I’ve personally tested and used in my travels. 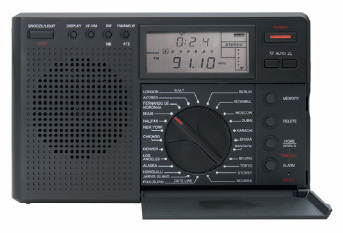 This Sony shortwave radio is a classic, with solid, time-tested performance, and features to please both the beginner and the seasoned radio enthusiast. It is full-featured, with excellent SSB and exceptional sync detection. I grab the ‘7600GR when I plan to do a little DXing on vacation. It has everything I need. The Sony ICF-SW7600GR is still made in Japan and the case is metal. It feels like a very high-quality portable when holding it in your hands. The lock button is a sliding switch on the top part of the radio face–easy to turn on and off intentionally, difficult to do so unintentionally. Additionally, it comes with a decent padded case. The ‘7600GR operates on 4 AA cells. The only travel feature the ‘7600GR lacks is an alarm, and that’s okay by me; for the features and durability, I’ll keep the Sony and use my cell phone or watch for an alarm. The instruction manual is comprehensive and easy to read. Read the full review here. Search eBay for a used Sony ICF-SW7600GR. Actually designed with the traveler in mind, the Grundig G8 will make for an excellent companion on your next venture. I’m quite impressed with this radio: shortwave reception is good, and FM reception exceptional. The AM broadcast band does suffer from some images (a type of signal interference in which aural “ghosts” of other broadcasts layer over the one you’re trying to hear), though still quite respectable. The G8’s audio is a little tinny out of the built-in speaker, though quite good for a radio this compact. The customary price for the G8 is $49.95, but occasionally retailers place them on sale for nearly half this price. I especially like the fact that there is a front cover on the G8 which protects many of the controls. The body is somewhat rubberized and the zip case that comes with the radio is padded and perfectly designed for suitcase/backpack travel. The G8 is also smaller than a paperback book. The G8 does not have SSB capability like the Sony does, but it is a good product for casual broadcast listener. The G8 also has a great alarm clock function and a world time selector switch on the front: simply dial up your time zone as you cross the planet. The G8 uses 3 AA cells. Purchase the Grundig G8 from Universal Radio. Search Ebay for a Grundig G8. 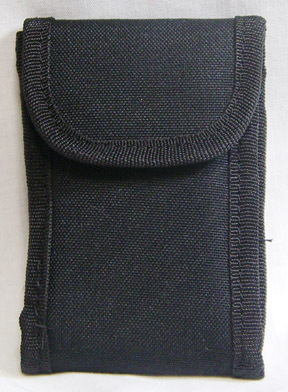 The County Comm Marathon ETFR Emergency Task Force Radio is a very small ultra-portable radio. The ETFR is similar to the earlier County Comm GP-4L, but was produced initially for the Canadian military, thus it features enhanced cold-weather operation. 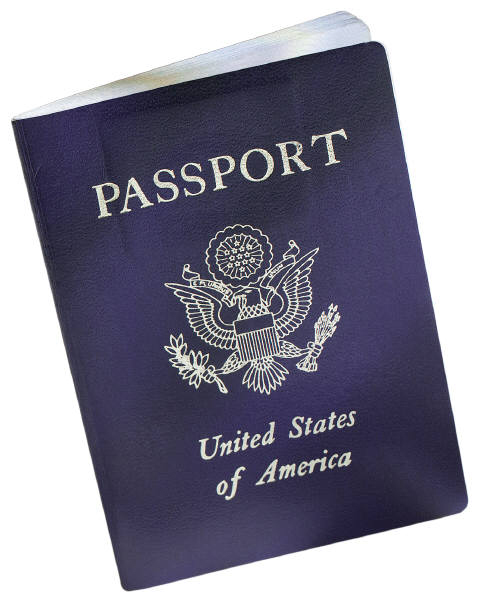 It is very durable–indeed, military-grade durability at least with regards to impact. To my knowledge, it is not waterproof, but it will certainly withstand your airline’s roughest luggage treatment. The ETFR is no incredible performer, but the price is low and it is quite capable of catching the major international broadcasters–indeed its sensitivity is better than I had anticipated. The tuning is actually analog, though the display is digital, thus you can expect a little receiver drift if you keep this radio on a broadcast for very long. The ETFR operates efficiently on 2 AA cells providing up to 150 hours at 40% volume or 70 hours of illumination from the built-in LED light. The ETFR also has a built-in clock and alarm feature. In my humble opinion, all frequent travelers should keep a County Comm ETFR in their go-to vehicle and/or travel bag. Also (I have to admit) this radio looks very cool in the carry case that Universal sells. Together, these make a great bon voyage gift for any traveler. 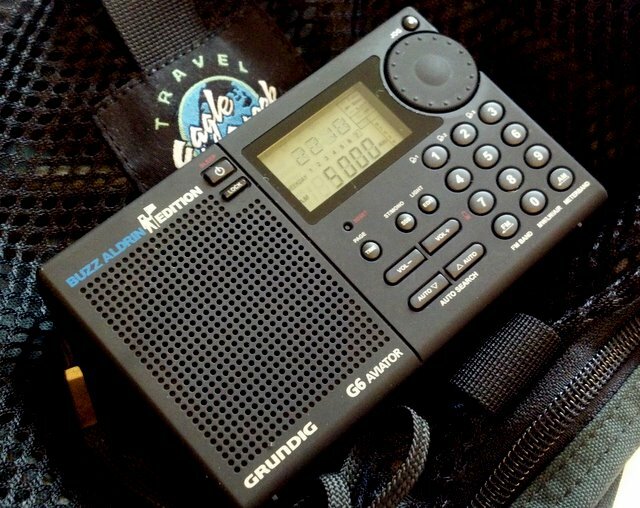 UPDATE 11 March 2012: Check out our latest post and review of the Grundig G6–a pocket-sized portable ready for the road warrior. My Tecsun PL-380 and the small Eagle Creek pack that also holds my Zoom H1 recorder, earphones, audio cables, external antenna, spare batteries and Kindle. UPDATE 23 May 2012: Yes, I’ve also added the incredible PL-380 to the travel list as well. Read the full post here. Thanks for the comment, Alan! This entry was posted in AM, Radio Gift Guide, Radios, Reviews, Shortwave Radio Index and tagged Best Portable Shortwave Radios For Travel, Best Travel Shortwave Radios Review, County Comm ETFR Review, Durable Portable Radios, Durable Shortwave Radios, G6, Grundig G6, Grundig G6 review, Grundig G8 Review, Rugged Shortwave Radios, Sony ICF-SW7600GR, Sony ICF-SW7600GR Review on August 6, 2011 by Thomas.